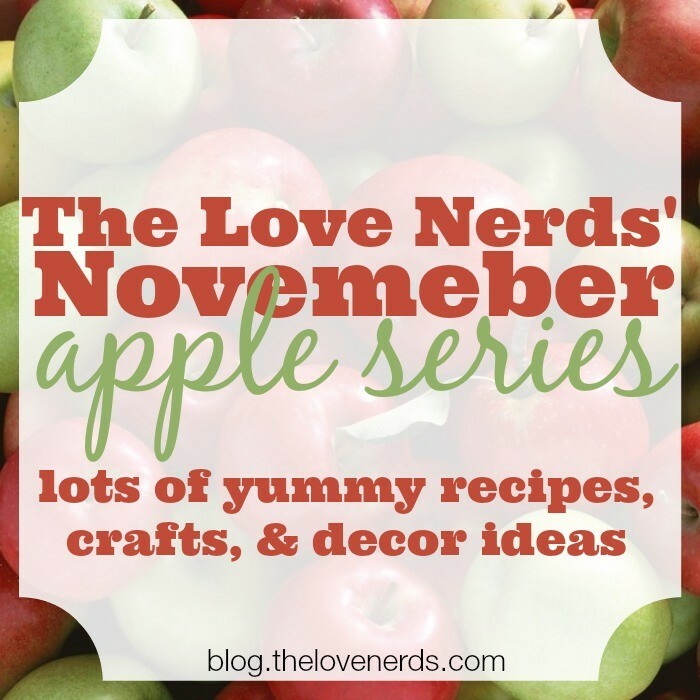 The Love Nerds is all about apples this November, and this is the FIRST post in our Love Nerd Apple Series. 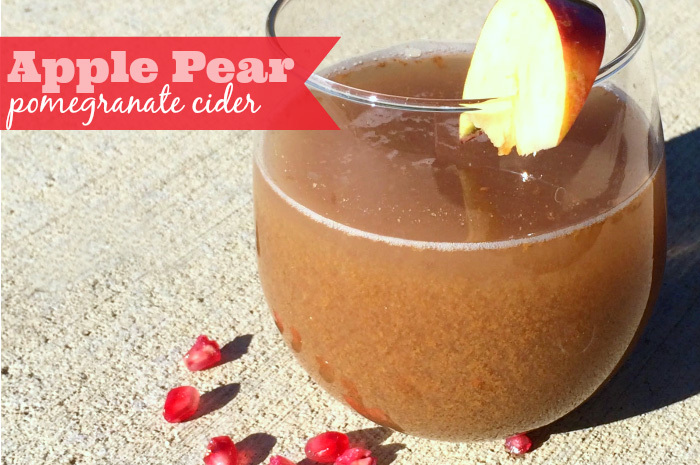 Say hi to Katie from DIY Life After College and enjoy her apple pear pomegranate cider recipe. Each year my husband and I like to purchase apple cider so we can use it for cocktails. If you’ve ever had “Hard Apple Cider” before (dark rum mixed with apple cider), you know how delicious it is. But you also know how sweet it is. Trying to be on the healthier side, I wanted to make my own apple cider; this way I know there aren’t any preservatives or refined sugar added to it. I went into making it thinking I would sweeten it with honey, but after it was all said and done, it was sweet enough on its own! 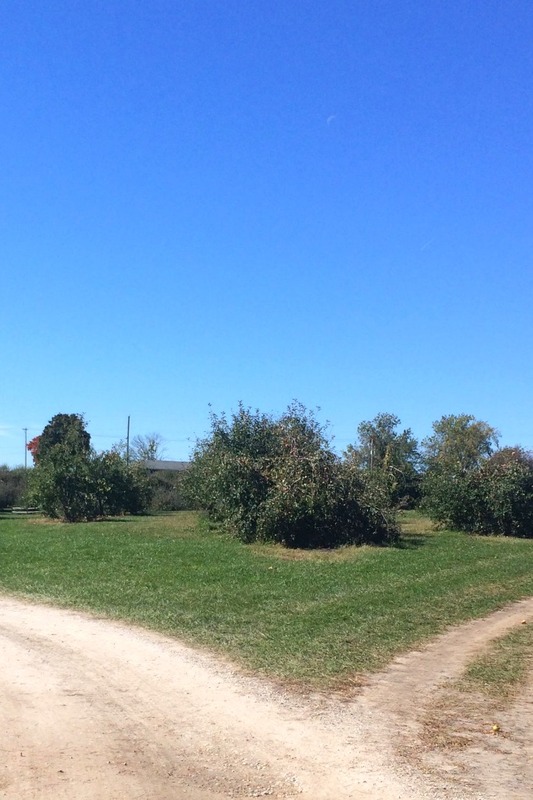 As a new fall tradition, we went out to a local apple orchard and picked apples. It was only $8 for a 10 pound bag, and they encouraged us to eat apples throughout the picking process. There were four different apple trees to pick from. Don’t ask me what types of apples they produced, because I really wasn’t listening, but hey, I remembered that there were four different types! Apple picking was surprisingly fun; they took us on a hay ride to the apple trees, then it was sort of like a scavenger hunt to look for the perfect apples. Side note: Go in late September/early October. By the time we went (mid October), it was difficult, but not impossible to find decent apples to pick. Also, do not forget to grab an apple picker. After we were done walking around apple trees, we picked up a $2 bag of mulling spices. You can usually find these at the grocery store, too. How pretty are these trees?? 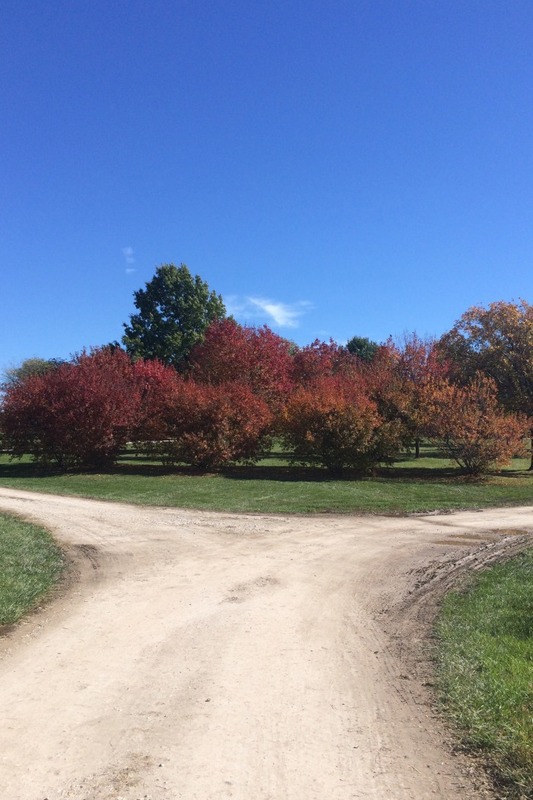 They aren’t apple trees but I loved the fall colors. When we got home, I will admit that it took me over a week to finally get around to making the cider. Before I could do so, I needed to grab a few other ingredients at the store. 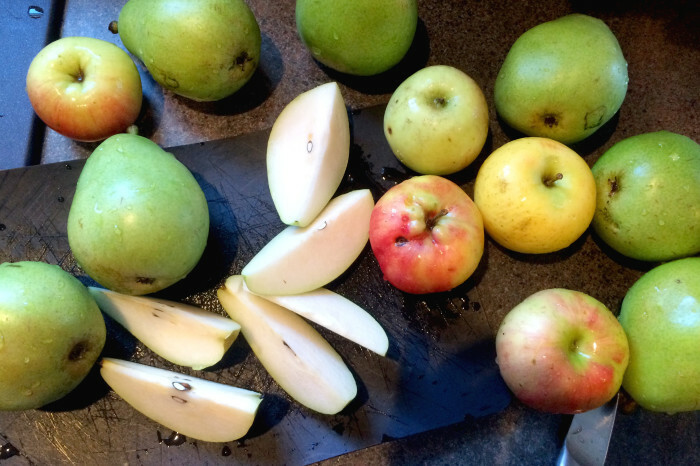 By that time, a few of the apples in the bag started to get mushy and ferment. Oops. Before getting started, I made sure to thoroughly wash the apples, since some of them had spider webs on them. Call me crazy, but I couldn’t stand the thought of spider webs possibly making their way through the juicer, and ingesting spider webs, or worse, spider babies. If you do not have a juicer, now is the time to reflect on your life choices. Go ahead and use this process to get the juice from the apples and pears. Slice your fruit, add them to a large pot (you will more than likely need more than one pot), then cover them with water. Squeeze in the lemon juice, add the pomegranate seeds, vanilla, and mulling spices. With a juicer: Slice all of the fruit into pieces small enough to fit into your juicer. 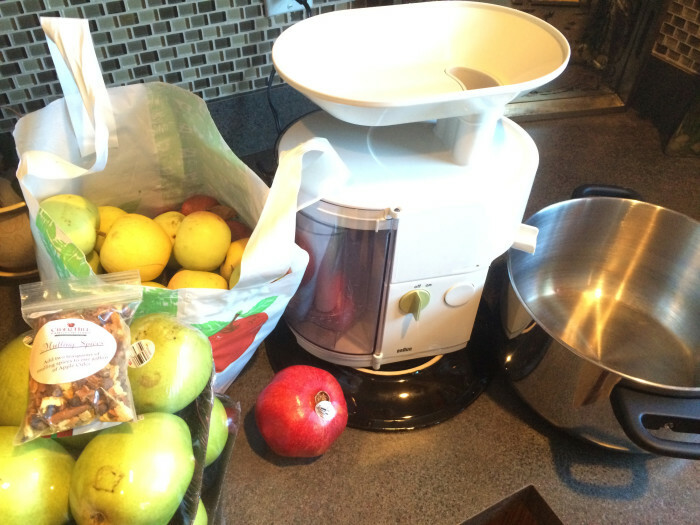 I didn’t worry about the stems, seeds, or skin/rind of the apples, pears, and lemon, the juicer did the work for me! As for the pomegranates, I cut them open and only put the seeds through the juicer. The juice went directly into the pot, so after I was done juicing I simply transferred it over to the stove top. 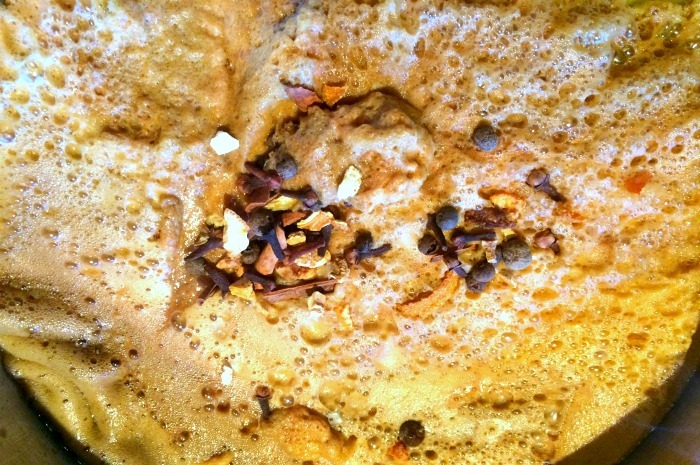 Leave the foam, add in the mulling spices and vanilla, then bring the pot to a boil. You can bundle the spices in a tied cheesecloth, or a coffee filter will also work. I chose to let the spices float freely in the pot. That’s also an option if you don’t mind straining the cider later. Skim through the cider with a slotted spoon, or strain it to get the mulling spices out. Taste the cider, and stir in honey 1/4 cup at a time if you would like it sweeter. Pour Apple Pear Pomegranate Cider into a large pitcher. My pitcher holds 4 liters, and the cider filled up about 3 liters. To my satisfaction, there was room for alcohol. 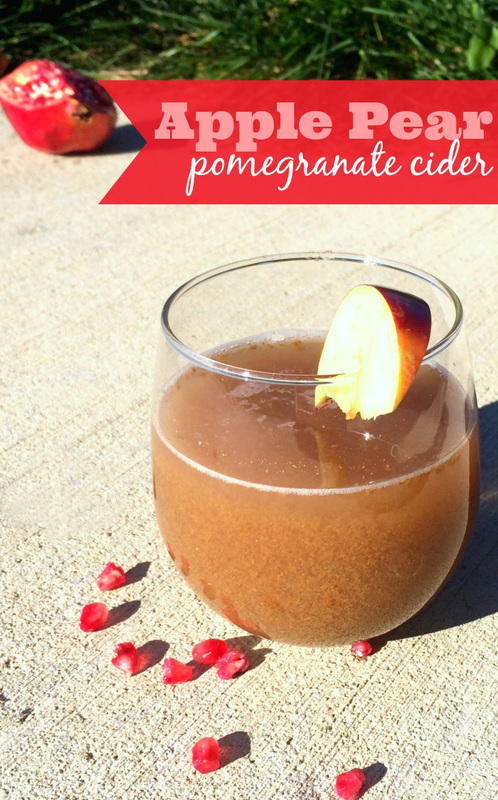 Homemade Apple Pear Pomegranate Cider - A delicious and healthier cocktail for your fall parties! Now onto the fun part, all of the delicious alcoholic mix-in possibilities! Whiskey personally sounded good at the time, so I stirred in about 2 cups into the pitcher. The amount of alcohol is really up to you. If you’re unsure about the ratio, pour the cider into your glass/cup and add the liquor there so you don’t accidentally ruin the whole batch. When in doubt, start with a shot (1.5oz) in your glass and add more as needed. You may even wish to sugar the rim with honey/brown sugar, or simply garnish with slices of apples, or pomegranate seeds. Have fun with it and enjoy! What alcohols have you added to apple cider? I love apple season and this looks great. Thanks for linking up to the Bloggers Brag Pinterest Party. I have added a pin to the Bloggers Brag Pinterest Board.